This runs first on the list. You will want to know what actually you need to know. It will contain some of the questions like what opportunity are you looking in your next job? Questions related to the salary expectation, the type of environment willing to work and so on. Try and learn as much as you can and also give them all what can you give. Also find out the answers to all possible questions like the ideal candidate fitting for the job, you may even ask about the hardest part of the job that a person finds and so on. By asking all such questions, you will be able to know everything in detail . Being generous lies here in terms of being flexible on the terms of time as well as adjusting when required. You can even talk to the recruiter about hiring of the more employees at the similar position. Do not hesitate to offer others a chance to feel good as you do, by being at your position. You may discuss all what you need being at that position with the recruiter and explain with full generocity. 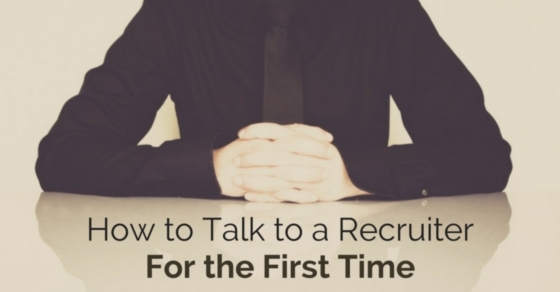 You must practice talking to a recruiter on phone first. Practising should be done before hand. You may ask any of your friend to act as a recruiter and then talk. When you will practice, you will come to know all about how to talk, how to start the conversation and so on. Confidence is the key. You should be confident enough to talk to the person standing infront of you or even if you are on email. You should speak confidently, giving your best without stammering and without any flaws. If you will not be confident, then you will not be able to achieve anything as only confidence will help you become something and nothing else. know the topic on which you have to discuss with the recruiter thoroughly and go in depth of that matter. This is because if you will be knowing all about the matter, in case of cross questioning, you will be able to answer back the queries. So, before talking to the recruiter know about the topic. While you talk, your voice should reflect the energy you have in you. You must not talk in a lazy and slowly manner. Just be audible enough and also show your zeal. This matters a lot while you are getting hired as if you will have no energy in talking, then you may have to face the rejection. So in order to get selected, just give your best and show that you do have some potential. If you are going to talk to the recruiter on phone, then make sure that you are available to him or her whenever they require. Just make yourself free to talk to the person when they need. Also make sure your mobile set is technically sound and no disruption arises in between the conversation or it will make you loose the opportunity forever. Only tell what you know properly. Do not make fake notions instead be true and honest. Do not lie of what you don’t know. You may say less, but stay true. If you will be true, you will be able to answer the sub questions but in case you lie, you will not be able to answer the questions and therein your lie will come to the forefront. Thus, will disrupt your image in fornt of others. Thankful attitude for a recruiter’s effort goes long way and if it is from the very beginning, then that’s much better. If your recruiter appreciates your efforts, that’s probably the best signal which shows your relation with the recruiter may go long way. A simple thank you from recruiter is refreshing enough at the end of the conversation. So, show your gratitude and always have thankful behaviour. Reading is must for this. If you will read more, only then you will come across the recent happenings. Your current knowledge, current skills, career goals matter a lot while you are speaking to a recruiter. While you talk to the recruiter, he or she will ask you for the updated resume. So for that too, you must be well prepared. Keep your resume updated and also keep a copy of that with yourself. If you are talking to the recruiter on phone, then also take a picture or either keep the soft copy of the file in your mobile too, so that whenever it is needed, you are able to send it. Be smart to handle both the situations. Have you ever worked with the recruiter? If yes, well and good as you will have an idea behind the whole process and if you have never worked before, then it will be a good idea to enquire about the whole process and then talk to the required recruiter. Do not go in front like a dead pan and an empty vessel. Just be upto date and only then you will possess the confidence of saying something to the recuiter. You are going to talk to the recruiter. They are the professionals in their fields and they ought to speak in all the technical jargon they know. So you must also know about all such things, technical words and so on. If you will speak in a simple manner without making use of the good words, you will be considered having lack of knowledge. While you meet the recruiter in person, make sure to make a good eye contact as it reflects the confidence in you and also it shows that you have some knowledge regarding the matter. If you are there on phone, then also concentrate on what he or she says to you. If you are there on phone with the recruiter, first give him or her a chance to speak and then your duty will be to listen him or her. Let the other person speak fully and do not interrupt in between. Just be quite initially and after the recruiter ends up speaking, then say something. While you speak, think ten times before you speak. Do not say anything wrong. It would be better to speak less if you know less but do not speak unneccesarily without thinking. Speak up to the mark, after all you are talking to the recruiter and not your friend. So, just be formal in talking. You can get to know about the requirements by calling beforehand to the recruiter. If you are a fresher, you may not know what to do and what not to do or say. Requirement of the resume, other credentials and certificates or whatever else is needed, be prepared with that beforehand. Have an erect body language while you personally meet the recruiter. Your body language should not depict that you are lazy or unwilling to work. You should have confident body language as it depicts allot to others. Your hand shake should be firm and maintaining the eye contact is must. Keep smile on your face and do not take a frowning face in front of the recruiter. So, above are the points which will help you in talking to the recruiter. Many other things should also be kept in mind but some of the essentials are given above. Recruiters are professionals and if you are a fresher, ask and consult any experienced person to know what to say and what not. This will help you allot and act as a guideline which will help you be a better person infront of the recruiter. Do not hesitate or feel shy in presenting yourself. Just be yourself. Give your best and you will turn out to the best among others. Next articleWhat to Say When You’re Asked to Work for Free?